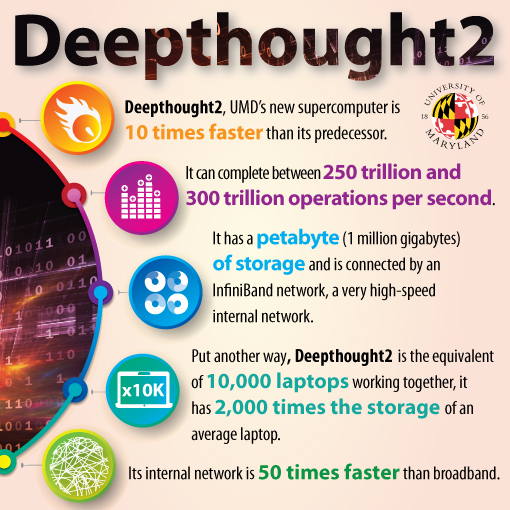 The University of Maryland unveiled Deepthought2 today, one of the nation's fastest university-owned supercomputers, to support advanced research activities ranging from studying the formation of the first galaxies to simulating fire and combustion for fire protection advancements. Developed with high-performance computing solutions from Dell, Deepthought2 has a processing speed of about 300 teraflops. "To be among the best requires research and educational facilities that are among the best," said University of Maryland President Wallace D. Loh. "Deepthought2 will attract top researchers and students who need its data-intensive computing power," Dr. Loh said. Several university divisions and colleges and researchers from a variety of disciplines worked together to obtain this new central computing resource and to bring online the new Cyberinfrastructure Center – a facility specifically designed to provide the needed space, energy efficient climate control, and backup power for the supercomputer. "Deepthought2 places the University of Maryland in a leadership position in the use of high-performance computing in support of diverse and complex research," said Ann G. Wylie, professor and interim vice president for information technology. "This new supercomputer will allow hundreds of university faculty, staff, and students to pursue a broad range of research computing activities locally – such as multi-level simulations, big data analysis, and large-scale computations – that previously could only be run on national supercomputers," Dr. Wylie said. "High-performance computing is key, and Deepthought2's expanded capabilities will further Maryland's research funding competitiveness and help UMD researchers bring in new grant money to fund the science enabled by such a powerful local facility," said Derek Richardson, UMD professor of astronomy.